The welcome reception will take place at the lovely Botanic Gardens in Utrecht. During the welcome reception you can register for the conference, enjoy a drink, and meet international colleagues and friends. This year a conference dinner is included in the registration fee! The restaurant is located in an old hostel, and many original features have been preserved. Drinks are included. Transport to the restaurant will be arranged if necessary. Transport: A bus will depart from De Uithof at 17.30 h pm. If you are not using our transport, make sure to be at the start point between 17.45-18.00 h pm. Transport back to hotels will (in principal) not be arranged since most hotels are located in the city center. 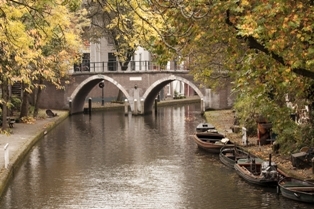 The city walk takes in the Utrecht hotspots, such as the Dom tower, canals, wharves, churches and typical alleyways. Additional historic information is provided about Utrecht and what makes it such a special city; perfect for those who are not yet acquainted with it. After a 1,5 hour walk you can enjoy a three course dinner at a restaurant. All courses can be chosen beforehand. 3 drinks are included.